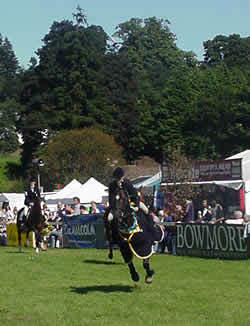 The Bowmore Blair Castle International Horse Trials and Country Fair finished yesterday in glorious sunshine at Blair Atholl. The organizers were delighted with the way everything went and reckoned around 30,000 visitors attended the event and enjoyed seeing some of the world's top riders in action in spectacular surroundings. Despite a few showers on Saturday afternoon, the cross-country course rode well, while conditions could not have been better for Sunday's showjumping. Winner of the international two star three day event for the second year running was Lucy Wiegersma, from Cornwall with Susan Hunt's nine-year-old mare, Friday Morning. This is the first time that anyone has won the two star section in consecutive years and made Lucy's journey worthwhile. Lisa Maynard's Sky Sport obviously enjoys the unique atmosphere at Blair, he won the one star event in 2001 and came a close runner up to Friday Morning this year. Third was Terry Boon and The Irish Gunner. Terry had been leading after the dressage on his other horse, Grove Joucas, but unfortunately had to retire during the cross-country phase. Highest placed Scot was David Gatherer from Renfrewshire riding Anne Prentice's Aero Dynamic II. He finished in 7th place and was a member of the first place Scottish team along with Suzanne Lumgair, Peter Laidlaw and Richard Telford. In the one star competition, Heidi Simmons from York moved up from third place overnight to first with a perfect showjumping round on her own seven-year-old gelding, The Biz. Oliver Townend and Lady Windsor came second with the overnight leader Ruth Friend and Mister Barnabus in third. 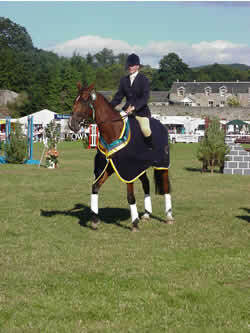 Top Scot was local girl, Louisa Milne Home from Milnathort with her own and Evelyn Crombie's grey gelding, Melody River. She finished in 10th place. In the one star team event the English team of Christine Hardinge, Alex Bryne, Oliver Townend and Craig Anderson came first. Results - CCI** - 1, Lucy Wiegersma (ENG), Friday Morning, 58.61; 2, Lisa Maynard (GBR), Sky Sport, 62.41; 3, Terry Boon (GBR), The Irish Gunner, 73.2; 4, Chris Hunnable (GBR), Red Quest, 73.4; 5, Jason Ferguson (GBR), Spring Savannah, 76.61; 6, Ken Spencer (GBR), Hakkinen, 82.01. Wiegersma (GBR), Friday Feeling, 54.57. CCI** Team - 1, Scotland; 2, Great Britain; 3, Under 25's. CCI* Team - 1, England; 2, Young Scotland; 3, Old Scotland.